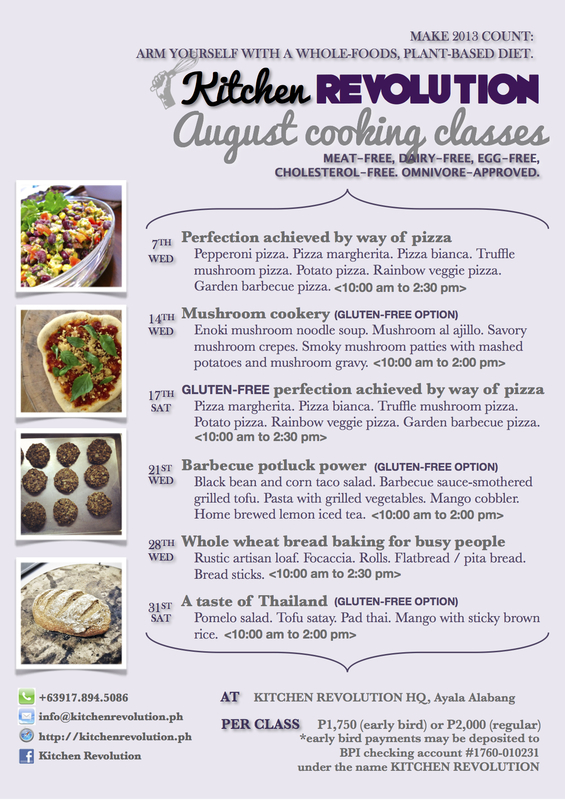 August is just around the corner; check out what healthy cooking classes are in store this month! We’ve got 2 PIZZA classes scheduled – a TRADITIONAL class on the 7th (Wednesday) and GLUTEN-FREE on the 17th (Saturday). In the traditional class, we’ll make a whole wheat crust the knead way and the no-knead way. On gluten-free pizza day we’ll make a crust that tastes just like its gluten-full counterpart and a quick lazy version, too! 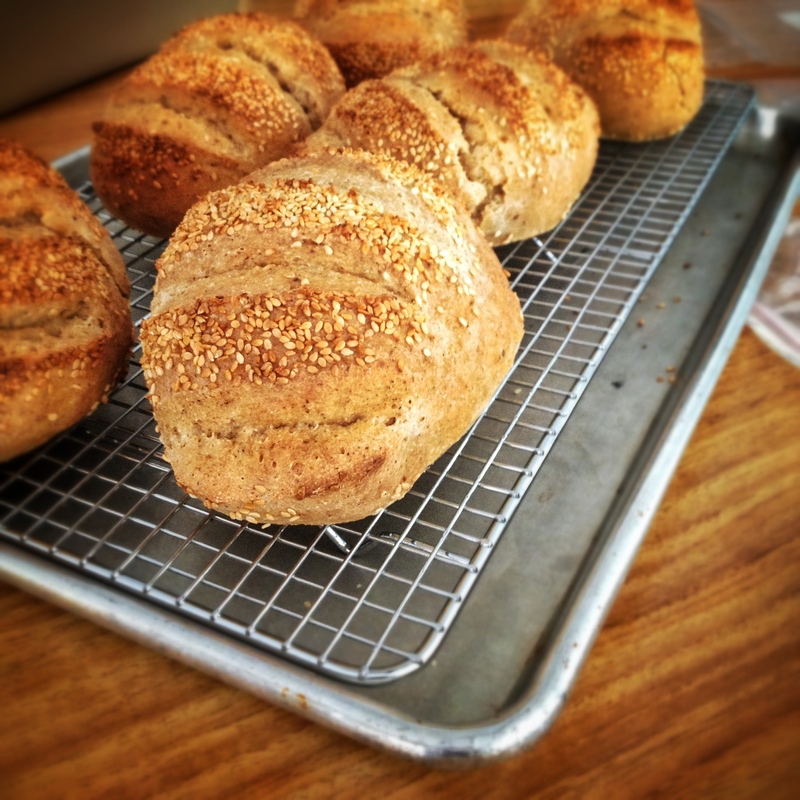 If you crave crusty bread, want to learn how to bake it at home, but don’t want to spend hours in the kitchen, then BREAD BAKING FOR BUSY PEOPLE is the class for you (on the 28th, Wednesday). 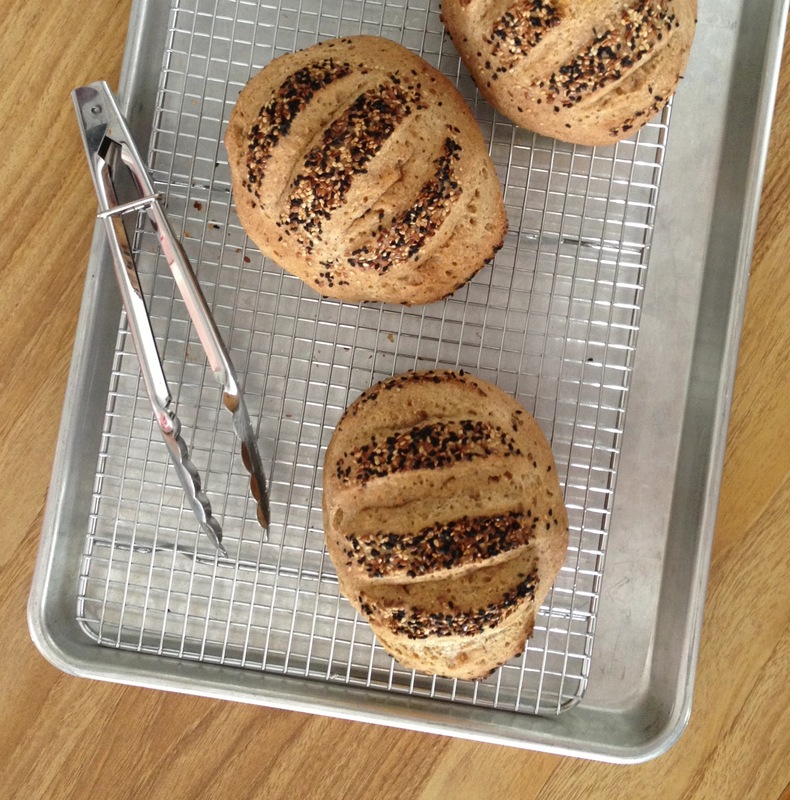 Discover how my no-brainer whole w heat dough can churn out 5 different kinds of bread! To register, fill up this form here. General info on classes here. How to pay for a class here. Photos of past classes here and here. If you’re gluten-free or just want something different for your daily bread, perhaps you remember I bake artisan gluten free bread. Currently round loaves and / or baguettes are available at Edgy Veggy (Kapitolyo, Pasig), Corner Tree Cafe (Jupiter St, Makati), Ritual (Malugay St, Makati), The Superfood Grocer Philippines (New Manila), and through me (Alabang) directly. Check out this newcomer: focaccia. Current flavor available is rosemary and sea salt. Comes in an 8-inch round and pairs well with salad, soup, or protein of choice. P150 per piece. 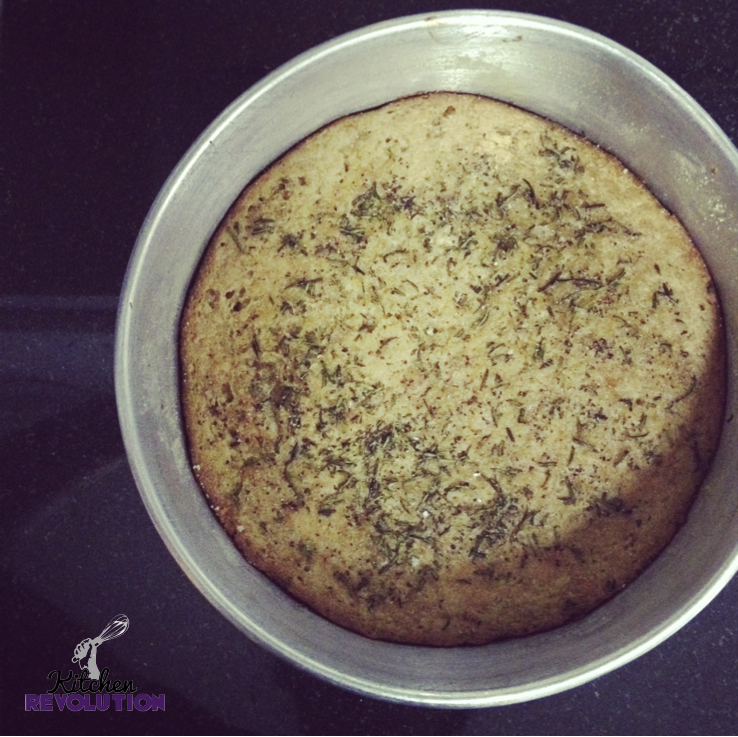 Made with brown rice flour, sorghum flour, cassava starch, sago starch, flax seeds, and extra virgin olive oil. Dairy-free, gluten-free, nut-free, vegan. If any of the establishments mentioned above is close to you, do request that they carry my focaccia! This one’s not yet for sale. Soon, soon! 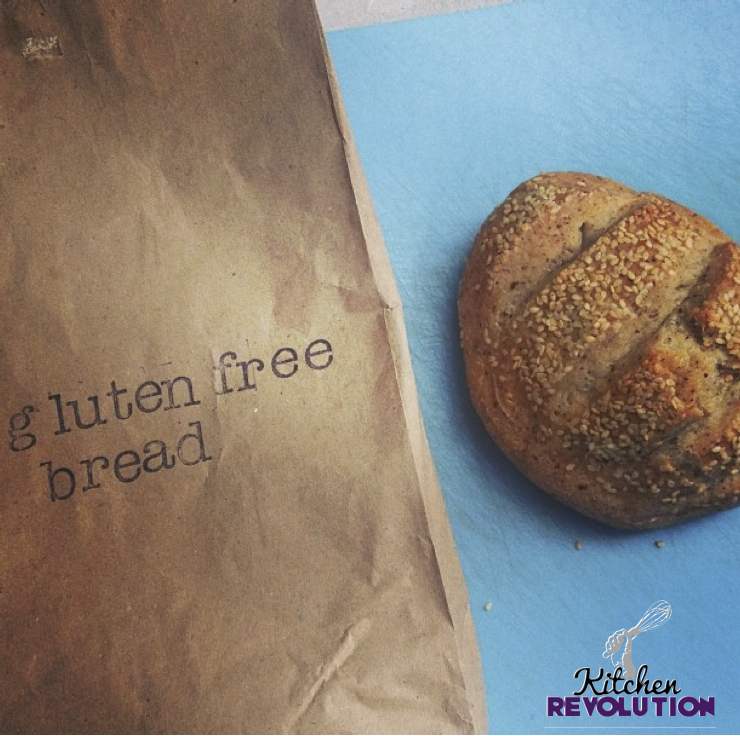 Gluten-free bread update + cookies! Before I dabbled in the gluten-free bread baking arts, I had no idea that Pinoys would crave this stuff. More and more people are experiencing the benefits of the gluten-free lifestyle or are trying to heal whatever health problems they have holistically through diet. I’m thrilled to help out in any way I can – if my obsession with alternative (and vegan) cooking and baking can support people’s health goals, well and good. Enter: gluten-free bread. Two establishments are currently carrying my bread: Edgy Veggy Cafe in Kapitolyo, Pasig and Corner Tree Cafe on Jupiter St, Makati. Edgy Veggy delivers to select cities in Metro Manila – see my previous blog post on the bread for more details. You can also pick up from Corner Tree Cafe in Makati. And, if you frequent the southern Metro Manila areas, I carry my own bread too! Send me a message 0917-894-5086. This is perfect if you desire freshly baked bread straight from the source (Alabang). P130 per loaf. Hello gluten-free friends, if you miss your daily bread but fear the G-word, this may be the answer to your prayers. 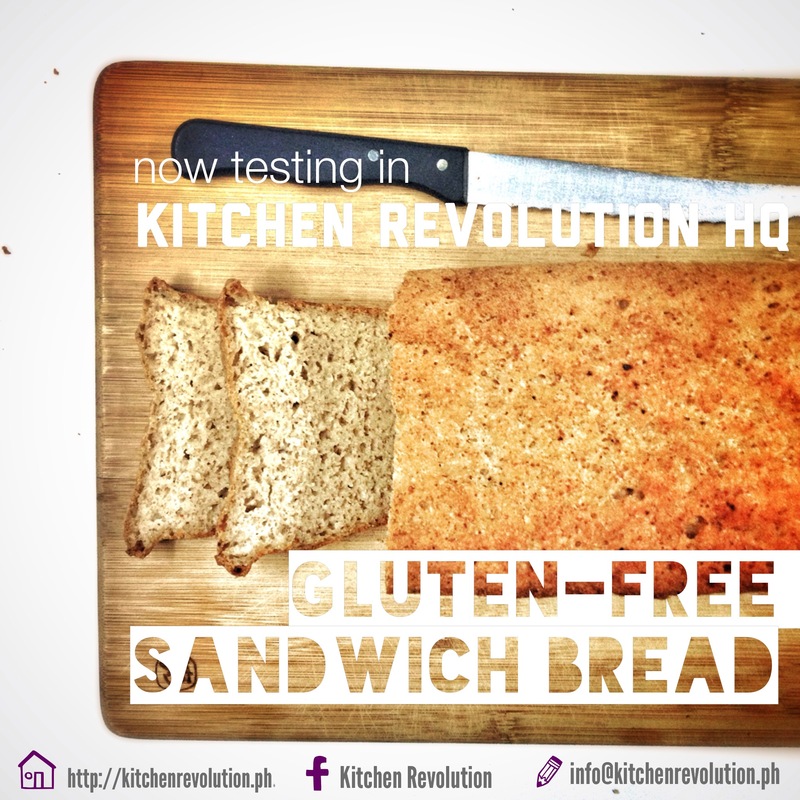 Freshly made gluten-free bread (P130 per 1 pound loaf) by Kitchen Revolution is now available for pick ups in Alabang or delivery by Edgy Veggy. Edgy Veggy delivers in Makati, Ortigas, and Fort Bonifacio for P500 minimum order and purveys other yummy vegetarian food that can be added to your bill. They usually pick up bread on Tuesdays so send in your orders by the weekend (text Denise +63 917 820 2081). You can opt to pick up the bread from the Edgy Veggy Cafe in Kapitolyo. More on Edgy Veggy here and here. If you want a Makati pick-up point, leave a comment below! I may be able to work something out with Ritual (at The Collective). Check out their website here. This crusty bread is made with brown rice flour, sorghum flour, cassava starch, flax seeds, and lots of vegan love (sesame seeds sprinkled on top, too).